Just received an email notification that a coworker had sent me a file via YouSendIt. YouSendIt Strike One: So I clicked the link in the email and was then required to create an account in order to access the file. I understand why you would need to create an account to SEND a file, but why to RECEIVE it??? Especially since the file is accessed only by a long specially encoded link that was sent via an email generated from the service itself?! And yes, by having an account, you could login to see older files that had also been sent to you (even though the default apparently is for them to "expire" in 7 days - so what's the point? ), but why not, at the very least, also just have a way to come in and download a file that someone sent to you without having to jump through hoops? YouSendIt Strike Two: Then I had to wait upon an account confirmation email, click on the link in that email, and then log in. Ok, so YouSendIt wants to make sure my email address was valid, but they already knew it was because I got to the site in the first place via a link that was sent to that exact same email address by YouSendIt! 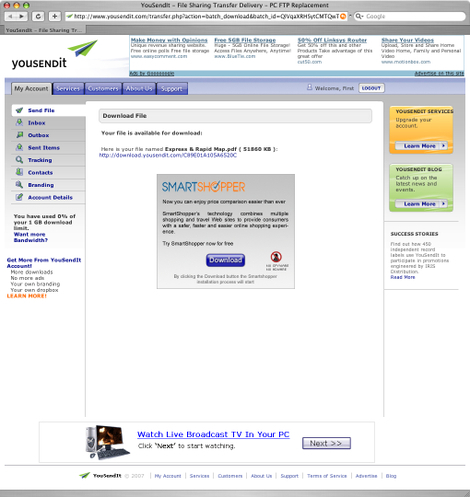 If YouSendIt spent a moment on usability (but still inexplicably insisted upon file recipients having an account) they could at least skip this email confirmation step if the email address provided for the account matched that of the email address that YouSendIt sent the file link to in the first place. And, if you just provided an email address and password to create the account, why 30 seconds later, after clicking on the link in the confirmation email do you have to log in? It is the same friggin session! I can see if you came back an hour later or such, and I know many other services make you do this as well, but why make users go through extra steps when they are not necessary? Why not take the extra few hours to code it right and save each user a few minutes? YouSendIt Strike Three (which is the big one that led to this rant): Then I was presented with the following page (see below or click here for a larger version). Where on that page would you click to download your file? Perhaps that big blue Download button in the middle of the page? Nope that is an .exe file that they are apparently hoping to trick you into clicking on and downloading to your computer. Ok, YouSendIt is a business and they need to make money, but if they need to trick people into clicking on a button to download an .exe file, they really have crossed the line into outright annoyance. YouSendIt now has my email address (which they had anyhow, courtesy of my coworker who sent me the file through them), but they will never have my business. The software does not require people to register or do anything special to access the files you have sent, and no tricks. We are just trying to provide an experience as simple as possible.